Drinking ale is almost like drinking a glass of wine, in the sense that many people prefer to savour the flavour, rather than gulp it down without it touching the sides. To release the full impact of the flavours, some ales demand a wide or curved glass, such as a snifter, which helps to release the infusion of ingredients, enhancing the drinking experience. Pilsner, on the other hand, is all about the fizz. Many of us know that there's nothing worse than being served up a pint of flat lager. And serving pilsner (otherwise known as a pale lager) in a rounded glass goblet meant for dark ales isn’t going to keep the carbonation going for long. Instead, try a tall straight glass with a slightly wider top, as this helps to encourage bubbles and a foamy head, helping to release the flavour. So why are you looking for the best beer glasses? They make a great gift, but make sure you know your friend’s preferred refreshment before you go buying one that doesn’t complement their choice. They’re also available in a wide range of styles - perhaps a slightly flamboyant goblet for the father in law or a classic jug for great Aunt Bridget, who swears by a pint of Guinness a week for good health. A picture of a British pub isn’t complete without a row of tankards dangling from the top shelf. They have been present in our pubs since the first half of the 20th century and have become a chalice in which to inspect and then savour the quality of a decent pint of ale or lager. Now, you can enjoy this ritual from the comfort of your armchair with this box of 4. We’ve had the classic ale jug, now it’s time for a long glass. Traditionally, these glasses, with their long bodies and open heads, are designed to help maximise the way in which pilsner is meant to behave in the glass. Forming a frothy head, you can enjoy the release of the aromas while trying to avoid a beer moustache! These are an old faithful for the cupboard as they’re pretty good for pouring your favourite can or bottle into, too. If you love a stout or an IPA, then this is the glass for you. 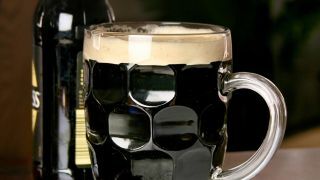 With these kinds of beers having such a strong depth of flavour, pouring them into a snifter glass allows the drinker to immerse themselves further into the drink. We must admit, there’s a little bit of performance and show around this glass too. And, to further big it up, you can swap the stout for your favourite pre bedtime tipple - great value for money! Yes, this glass is a little on the fancy shmancy side but it offers more than just good looks. For those who love an IPA or a strong ale, this is the perfect glass to encourage a fluffy head. It is also heavyweight with a particularly sturdy bottom - great for serving up trifles, pavlovas (yes desserts!) and a friend’s favourite cocktail. If you fancy yourself a beer connoisseur or know someone who is, you can’t go wrong with this set of 4 tasting glasses. The shape of each one has been optimised to serve up beers with perfectly frothy heads and smooth bodies, so you can appreciate the true quality of your preferred beverage from the comfort of your own home. Also, a great idea if you’re planning on having some friends over for a beer tasting session. Looking for a new beer to try? Why not brew your own with T3.com's list of the best home brew kits?